Everyone should be familiar with games based on the Threes or 2048 style gameplay by now, as they’ve been all over the app world the past few months. But if there’s one thing mobile gamers love, it’s new iterations on their favorite games. Hues – Threes/2048 Powered Up! by ReFocus Labs is a brand new game that brings a few colorful twists to this popular genre. Hue’s gameplay is very similar to other games in this genre. Players are presented with a board of 16 spaces that fill up with little colored tiles. By sliding their finger across the screen, players move all the tiles on the board one space in the direction they swipe. The object of the game is to match colors to create new colors. But ReFocus Labs does a great job of adding a little life to the action by making the tiles one of the hallmarks of the game. The art style of the game is inviting and friendly, presenting players with a “clan” of bright, colorful, and funny faces instead of numbered tiles normally associated with 2048 or Threes. It’s clear that the developer wants players to enjoy these “characters” as there’s a section of the app that is a gallery devoted to showing off the whole clan as players unlock them through playing. Each tile has a name and brief, comical description, giving gamers a little personality and something to collect (and gamers love collecting things). The game also includes three game types for players to enjoy. The standard mode is a timed game called “60 Seconds,” in which (you guessed it) players get just 60 seconds to earn as many points as possible. The second mode is “75 Moves,” which gives players just 75 moves to earn their points. An “Endless” game mode is also available as an in-app purchase, letting gamers play without time or movement restrictions until they’re out of possible combinations. 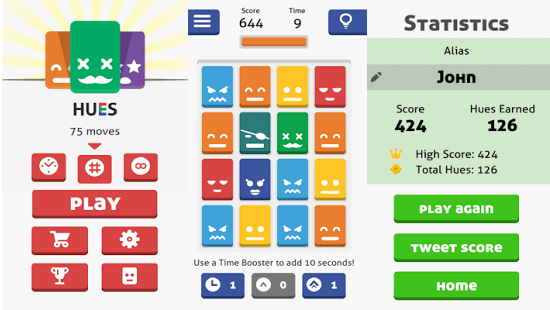 In addition to these different styles of play, the app also includes power-ups that add a small twist to the gameplay by affecting different aspects, such as adding seconds to the timer, adding more moves, or even leveling up a tile. These power-ups are bought with “Hues points” that the players accumulate as they play rounds of the different modes, however, these points are also available to purchase as an in-app purchase. Of course, the game offers players the ability to share their scores on Twitter, but Hues also has some other neat tricks. The app boasts an adaptive UI that changes color, as well as leaderboards to track scores, and the aforementioned character gallery for the “clan.” If you enjoy 2048 or Threes but want a little more character and liveliness in the experience, then this game is for you. With a bright color scheme, addicting gameplay, great personality, and a few neat twists that keeps gameplay fresh, there’s plenty to enjoy about this game. Just check out the trailer for yourself below. Hues – Threes/2048 Powered Up! is available for free download right now on Android, Blackberry, and Windows mobile devices. And be sure to check out the developer’s Facebook page to get the latest news on other ReFocus Labs projects. Click here to download the app on the Google Play store. Click here to download the app on the Windows Phone store. Click here to download the app on the Blackberry World app store.